This property, which dates back to the 19th century, belonged to Don Pedro Regalado Pedroso y Zayas, Commander of the Order of Elizabeth the Catholic. El Comendador, excepcional for the intimacy and the silence that its inner spaces provide the guests with, is the perfect lodge for seclusion and meditation. 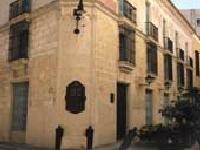 The house resembles the oldest Hispanic-Moorish constructions of the city with the main entrance by one of its corners. Apart from its privileged location: close to the Arm's and St. Francis of Assisi's squares, the sea breeze blows from the Havana harbor, which can be seen from the balconies of its magnificent rooms. The hotel holds a tavern named Onda, after a Spanish region. This rustic tavern serves a great variety of the Spanish tapas and exquisite wines.